Lasers. They’ve captured our imaginations for decades and were even at the center of one of Dr. Evil’s most beloved running gags in the Austin Powers movies. And now a team of researchers at Osaka University in Japan claims that they’ve fired the most powerful laser in the history of the world for the first time… and thankfully it didn’t take out any small planets with it. The researchers say that the laser “instantaneously concentrated energy equivalent to 1,000 times the world’s electricity consumption and entered the record books as the most powerful laser beam ever emitted.” This giant laser is 100 meters long and can emit a beam that’s as powerful as 2 petawatts (i.e., 2 quadrillion watts). 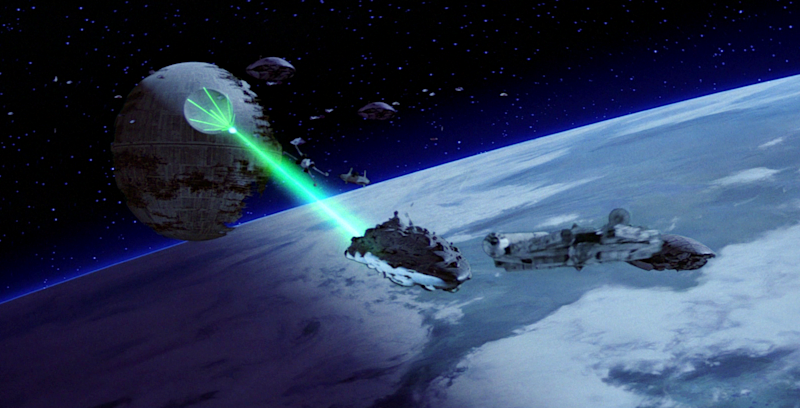 So with all that energy, this massive laser must have blown something up, right? Sadly, the reality was a lot more boring than that. “The energy of the laser beam itself was only powerful enough to run a microwave for about two seconds,” the researchers explain. Even so, this is an incredibly cool achievement, especially when you consider the goal is to eventually increase the laser’s power to 10 petawatts. Phys.org informs us that this team of researchers first talked about their mega-laser in an article in the journal Plasma Physics and Controlled Fusion back in 2012 but apparently they’re just now getting around to actually firing it at record-breaking power. Hopefully, this device doesn’t fall into the hands of a rogue oceanographer who figures out how to attach it to a giant shark. Because if there’s one thing that should scare us, it’s sharks with laser beams attached to their heads. This article, Terrafugia unveils new TF-X flying car design, originally appeared on CNET.com. Terrafugia unveils new TF-X flying car designThe updated TF-X. Terrafugia Getting a light plane-car hybrid off the ground seems to be an arduous process. The TF-X, by American flying car company Terrafugia, was announced in May 2013, and will be in development some years yet. The updated TF-X. Terrafugia But if your interest needed a pique, the company has announced something new: the updated exterior design of the TF-X (or outer mold line). In addition, Terrafugia said, the new design for the TF-X has been successfully tested in a one-tenth scale model wind tunnel, which is currently on display at the EAA AirVenture aviation convention in Oshkosh, Wisconsin. “The model will be tested at the MIT Wright Brothers wind tunnel, the same tunnel that was used to test models of Terrafugia’s Transition. The wind tunnel test model will be used to measure drag, lift and thrust forces while simulating hovering flight, transitioning to forward flight and full forward flight,” Terrafugia wrote. The original 2013 design of the TF-X. Terrafugia The TF-X is the successor to the company’s Transition aircraft, which was successfully flown at EAA AirVenture in 2013. The company, founded in 2006 by MIT aeronautics and management graduates in Woburn, Massachusetts, was expected to start delivering its first Transition units at a projected $279,000 in 2015 or 2016. However, delivery of the first units was originally expected in 2011 and has been postponed several times since then — and it’s still expected to take a couple more years and cost up to $400,000, according to a report on Engadget. The newer flying car will be a hybrid electric vehicle. It will have the capacity to carry four people, fit into a standard single-car garage, and be both street-legal and easy to fly — taking, on average, around five hours to learn to operate in the skies. It will also, Terrafugia claims, be able to take off and land vertically, with “auto-landing” at approved sites. from left to right: street mode; take off and landing mode; and flight mode. Terrafugia In May of 2013, Terrafugia said the development of the TF-X would take between eight to 12 years. So far, it seems to be sticking to that timeline. You can read more about what the flying car has to offer (and sign up for email updates) on the Terrafugia website. According to an Oxford University study, 47% of US jobs could be automated within one to two decades. It’s no surprise that technology is getting better, faster, and smarter. But is it at the expense of its makers? Anxiety has been building around the second machine age and its implications for our economic future, and it may have reached a tipping point. Just last week, Silicon Valley venture capitalists and executives published an open letter on the digital economy, calling for public-policy changes and new organizational models to account for this era of drastic technological change. But not everyone agrees. Several scholars have been sounding the alarm on the danger of technological progress. During a presentation at the Carnegie Council for Ethics and International Affairs this week, researcher Wendell Wallach said technology is now destroying more jobs than it creates. “This is an unparalleled situation and one that I think could actually lead to all sorts of disruptions once the public starts to catch on that we are truly in the midst of technological unemployment,” said Wallach, a consultant, ethicist, and scholar at the Yale University Interdisciplinary Center for Bioethics. Martin Ford, a software developer and Silicon Valley entrepreneur, recently published the book “Rise of the Robots” in an effort to generate a conversation around the prospect of a jobless future. We’re not worried enough, he says. Most people don’t understand the “mind-boggling” speed that technology is advancing at. “When people talk about robots, they’re mostly imagining factories, but the factory jobs have been gone for decades,” Ford tells Business Insider. In May, Shenzhen Evenwin Precision Technology, a manufacturing company based out of Dongguan in southern China, announced it would soon be replacing 90% of its 1,800 employees with machines. The 200 employees not receiving pink slips will take on a new role — overseeing the robotic workforce. This is part of a larger trend in southern China, where robots are poised to invade several manufacturing companies. 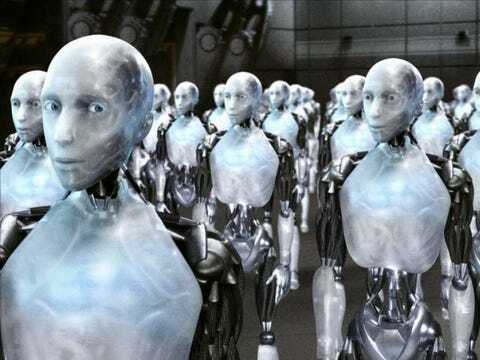 If that isn’t unsettling enough, consider the Oxford University study, “The Future of Employment: How Susceptible are Jobs to Computerization,” which predicts that 47% of US jobs could be automated within one to two decades. It’s no longer just the “dangerous, dirty, and dull” jobs on the block. Technology is also poised to replace white-collar positions, like lawyers, reporters, and financial analysts, to name a few. While certain sectors, such as healthcare and education, are safer than others for the time being, Ford believes most industries will eventually be at risk. But it’s not as much about what industry you work in, Ford explains, as it is the function you perform. Think about your job, he says, and consider whether or not any smart person could figure out how to do it if they watched you work or studied your past work patterns. With creative computing underway, even the most artful of jobs could be at risk. Algorithms can now write symphonies and paint original paintings, Ford tells us. “We should be concerned,” says Ford. “Primarily because we don’t have an alternate for people to lose their jobs. The economic consequences could be dramatic, he says. Jobs drive consumption, and consumption drives our economy. Of course, what Ford sees as a disaster, others see as an opportunity. The New York Times recently highlighted a study by the McKinsey Global Institute that presents a more cheerful outlook. Other experts point to the Industrial Revolution, which ultimately led to more employment opportunities, and say the same will happen during the second machine age. Some believe an increase in computing prowess will simply eliminate old jobs and introduce new ones, resulting in a net-zero effect — or even an increase in jobs. The solution to this job displacement is not a simple one. In the past, when low-skilled workers lost their jobs to technology, the conventional advice was to go to school for a better education and training and find more intellectual work in an office. This solution will no longer be effective, Ford says, because technology is coming after those higher-skilled jobs as well. 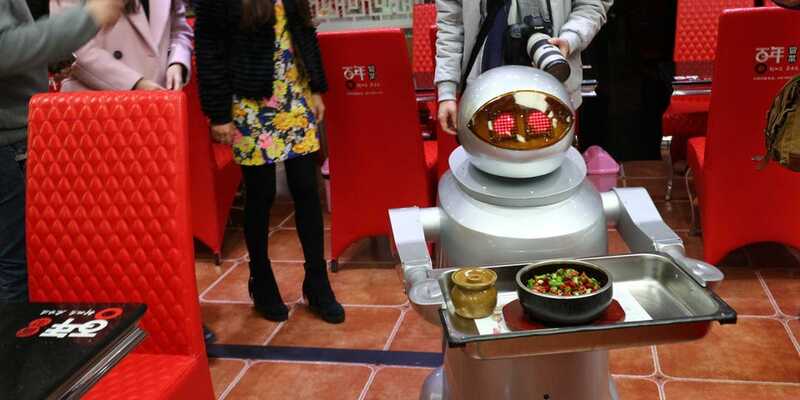 robotChinaFotoPress/GettyRobots are invading the service sector, where most of our jobs are. “Investment in education and training will unlikely solve our problems. We must look beyond conventional policy prescriptions,” says Ford. His solution is a radical one: To effectively restructure our entire system. Ford suggests a guaranteed income. Ford is not the only one proposing such extreme changes. Scott Santens, a leader in the basic-income movement — a worldwide network of thousands of advocates — agrees that job growth is not keeping pace with technology and encourages government-provided income as a remedy. For now, it might be time to consider strategies for staying ahead of the robots before they come for your job. Japan has opened the doors to the world’s first automated, robot-staffed hotel, replacing people with pretty, lifelike lady humanoid receptionists and a bow tie-wearing, dinosaur concierge. 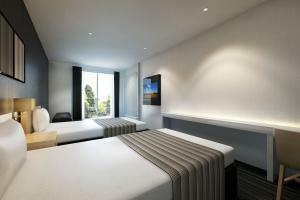 Likewise, as part of their aim to feature cutting-edge technology, stays are keyless. Instead, guests enter their rooms via facial recognition technology. Aside from its novelty factor, the use of robots and the emphasis on automated services is part of a bigger concept: To reduce labor costs, save energy, reduce waste, and develop a self-sufficient hotel powered by solar energy and machines. For example, rooms are conspicuously absent of refrigerators, lights are motion-sensored, and rooms are cooled using an energy-efficient radiant panel air conditioning system. The hotel is part of the Dutch theme park Huis Ten Bosch in Sasebo, Nagasaki, and may be expanded across Japan and abroad, said company president Hideo Sawada. Future plans also include the addition of Chinese and Korean languages to the robots’ repertoire. Other features include a porter robot, that will transport luggage to guest rooms, and a self-serve cafe which serves snacks and drinks from, what else, a vending machine. It’s not just Japan that’s replaced humans with robots in hotels. Over in California, not far from Apple’s corporate campus, Aloft Hotels put what they called the world’s first robotic butler at the front desk last year. Botlr is used to shuttle amenities to guest rooms and acknowledges requests with peppy beeps and flashing lights. Meanwhile, though the industry may be moving increasingly towards automated hotel services, the results of a recent JD Power survey that polled 62,000 guests in the US and Canada suggest that there’s still value in old-fashioned human contact: When staff greeted guests with a simple smile “all the time,” the average number of problems reported fell by 50 percent. Room rates at the Strange Hotel, which features 144 rooms, start at 9,000 JPY ($73 USD) for a single room. In an interview with Newsweek, NASA’s 3D printing chief Niki Werkheiser says the technology will revolutionize space travel by allowing astronauts to be away from year for years on exploration missions without relying on ground control.